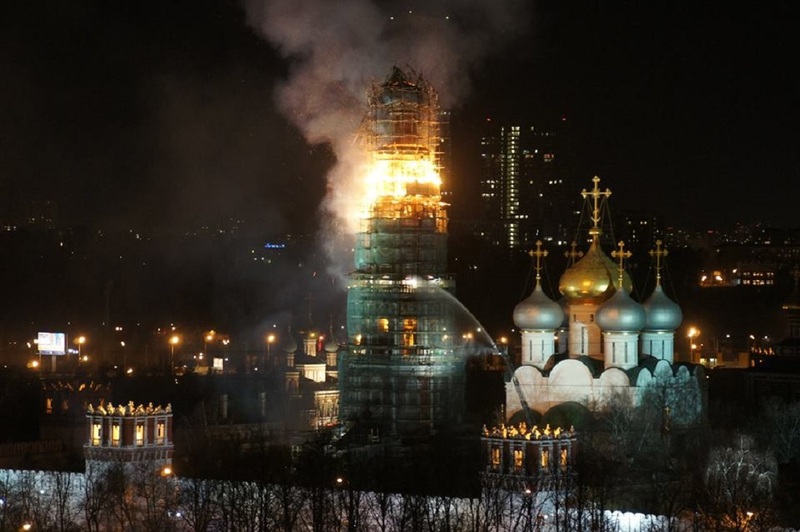 One of the bell towers of the Novodevichy Convent took fire on March 15’s night. Ministry of Emergency reported that firefighters arrived at the scene in four minutes after receiving information about the fire. The bell tower has been covered in scaffolding and bells were not removed. Reconstruction, commissioned by the Ministry of Culture of Russia, has been held since the end of 2014. Russian Ministry of Emergency got fire alarm signal on Sunday, March 15 at 22.41. The fire area was 300 square meters. The fire was liquidated on March 16 at 1.23. There were no injuries. According to Deputy Minister of Culture Gregory Pirumov, no serious damage has been caused to the bell tower, since only scaffolding burned. He also mentioned that the object is insured and everything will be restored. Prince Vasily III founded the Novodevichy Convent in 1524 in honor of the Smolensk Icon of the Mother of God. The Monastery is under the UNESCO protection and is declared a heritage of humanity.